An inexpensive way to produce beautiful custom nameplates. Why settle for boring, generic nameplates when your professional image is on the line? Our Etched Nameplates have countless options for customization. Up to 1 Sq. In. Up to 2 Sq. In. Up to 3 Sq. In. Up to 6 Sq. In. Up to 9 Sq. In. Up to 12 Sq. In. Up to 15 Sq. In. Up to 18 Sq. In. Size Measurement: To determine pricing, multiply height and width of nameplate to figure out the total square inches. 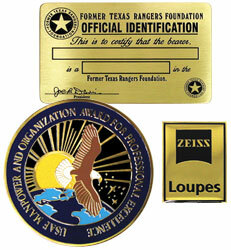 Price includes: Custom shape, .030" Brass or Stainless Steel nameplates, etched on one side. Add 20% for two-sided imprint. Finishes: Antique Brass, Antique Silver, Bright Gold, Bright Silver. Adhesive Back - $0.02 per square inch. Punched Holes - $0.03 per hole. Consecutive Numbering - $0.20 per plate. Leather Strap - $0.35 each. Packaging: Each Nameplate is individually polybagged. and just a phone call away!